For more information or to book contact us with your enquiry. If you are interested in requesting another journey within Australia (or anywhere else in the world) please complete a journey request form and one of our Rail Experts will be in touch with you within 48 hours. Today, you can make this historic journey with creature comforts that the original Ghan pioneers can only have imagined! When the legendary Ghan first departed Adelaide for Alice Springs, it was always intended that it would one day travel through to Darwin. More than 70 years later, that dream became reality with the extension of the track from Alice Springs to Darwin. 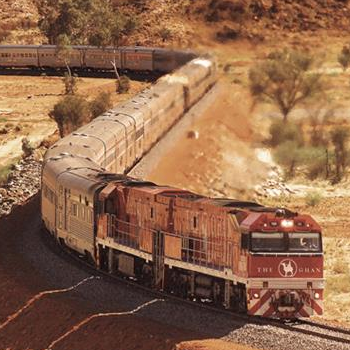 The Ghan now runs one to two times per week in either direction (depending on the season) with an overnight journey between both Adelaide-Alice Springs and Alice Springs-Darwin. The journey between Alice Springs and Darwin passes through Katherine where there is a long stop-over allowing for off-train touring and the chance to visit the Gorge. Board or alight in Adelaide for connections with the Indian Pacific and The Overland for guests travelling to or from Perth, Melbourne and Sydney. Alice Springs is the ideal place from which to explore the wonders of the Red Centre and we can offer a range of all-inclusive Rail Tour Packages to suit your timescale and budget including Alice Springs, the MacDonnell Ranges, Ayers Rock, The Olgas, the Sounds of Silence Dinner, Kings Canyon and much much more! For full information contact our experts here. Backpacker, Student and Child fares available on request, subject to eligibility. As we can book many months in advance of travel and, subject to availability, there are various Discounted and Advance Purchase Fares offered, the earlier you book, the better the fare! For further information on this offer please contact us. Please Note: The Ghan only stops in Alice Springs for around 3 ½ hours; this is not enough time to visit Ayers Rock (Uluru) as it is almost 300 miles from Alice Springs. Red Service - offers the choice of a Day/Night Seat. For the budget conscious, Day/Night Seating is in comfortable two abreast recliner armchairs with individual reading lights, footrests and generous leg room. All Red Service guests have access to the Red Service Diner where light meals, snacks and drinks are available for purchase. Gold Service - offers the choice of either a Twin or Single Cabin or a Superior Cabin with superb restaurant meals included in the fare. Gold Twin Cabins are en-suite of a shower and toilet and feature a comfortable three-seater lounge converting to snug upper and lower sleeping berths at night, with fresh sheets, pillows, doonas and towels provided by your dedicated carriage steward. Gold Single Cabins have most of the features of the twin sleepers with the exception of showers and toilets which are located at the end of each carriage. Gold Service Superior Cabin - there is only one Superior Cabin available per train which offers all the advantages of the Gold Service Twin Sleepers but features the added luxury of a double bed, lounge area, own bar and video/DVD player. A per night surcharge applies. Platinum Service - for the ultimate in luxury you can now experience the sophistication of the newly refurbished world-class Platinum Service carriages. Platinum Service features Twin and Double cabins twice the size of Gold Service Twins with a host of additional comforts including double aspect windows, 24 hour steward service, drinks and relaxation in the Lounge and Bar and exceptional meals in the Restaurant. In Gold and Platinum Service, enjoy superb meals with waiter service in the beautifully decorated Restaurant cars and the spacious facilities of the Lounge and Bar where you can relax with a drink and meet people from all over the world while marvelling at the breathtaking scenery of this wonderful country. All cabins offer a 3 pin power point, wardrobe, full length mirror and a fold-away table with reading lamp. Complementary toiletries and welcome kits are provided in each cabin. - Platinum Service also offers premium level comfort of a truly global standard. In addition to the new inclusions, Platinum Service guests are also treated to private transfers up to 50km to / from major rail stations and or airport pre or post-journey and also benefit from increased checked-in luggage allowance (3 x 25kg bags per person). When making Platinum Service bookings please advise the locations for pick up and drop off at time of reservation. - Private Carriages - for the ultimate experience in luxury, ask about your own - Private Carriage, perfect for groups of up to 8 guests (Chairman's Carriage) and up to 6 guests (Sir John Forrest Carriage). Available for meetings, parties or just a special family occasion, there are four Special Carriages to choose from each with their own characteristic charm.